The cakes were beautiful--and it was hard to decide which ones to purchase. We ended up getting a platter of personal cakes to share with one another. 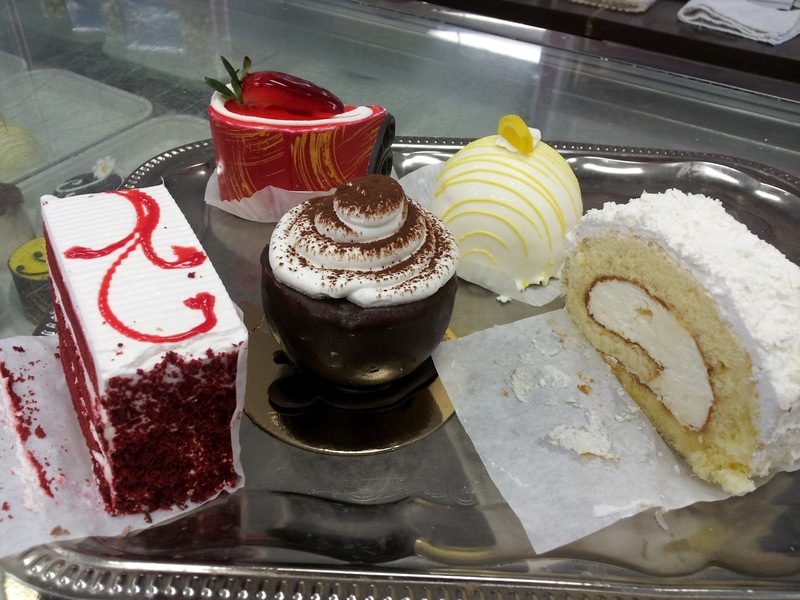 I picked the cake on the right--a yellow cake with whipped topping custard in the middle, icing on the outside. I figured I couldn't lose on that one and I was right. Delish! The red velvet cake tasted deeply of cocoa and was pretty good. It had some strawberries in it, too, which always pleases me. The strawberry kidney-shaped cake was cake and mousse. Pretty good but not my favorite, however two of my party loved it. The lemon cake was yellow cake and lemon curd, quite tart and I wasn't in the mood for it that particular day. It was covered in white chocolate. I also didn't want a mocha cake, which is the chocolate one in the center. However, my friend said it was pretty good. In the U.S. we use a lot of sugar and my international friends think our desserts are way too sweet. I agree. But...I do love some of them. I thought for sure this selection of goodies would be less sweet than our cakes in this country, but I was wrong. They were exactly as sweet. I don't know if it is because they are catering to the U.S. or if that's really how it is in the Middle East. I've never been there.